Sofas And Interior Design: Leather vs. Cloth | AKA Design, Inc. 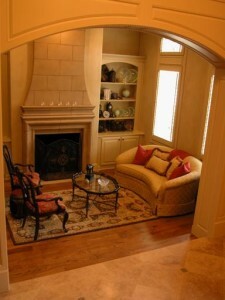 Interior design is about assembling a room to fit a specific theme and elicit a certain emotion. Whether that is warmth, elegance, modernistic, or something else is up to the homeowner and interior designer. The type of furniture used also plays a role in complimenting that overlook look and feeling. When it comes to sofas, there are two main types being leather and cloth or fabric sofas. Depending on personal preference, you might be using one over the other. One of the reasons that a cloth sofa might be used for interior design as opposed to leather, is due to its comfort. Now that’s not to say leather sofas can’t be comfortable and all cloth sofas are comfortable, but cloth tends to be softer. It also adapts better to changing climate whereas leather can become hot and sticky in the heat and cold to the touch during cooler months. Cloth sofas are also used because of their color and pattern versatility. While leather can come in a wide-range of colors, cloth has seemingly endless possibilities. Different patterns and stitching could be the perfect compliment to balance the color of the room. Cloth doesn’t get as scratched as easily as leather either. So sharp objects in pockets or pets’ claws won’t make streaking marks on the sofa like it could on leather. In general, cloth is used to help minimize the budget too. Interior design has a lot of give and take, especially due to budget constraints. Using a cloth sofa over a leather one is an easy way to remain in budget. Leather sofas are often used to create a more modern or elegant room for interior design. The sleek shine makes it an appealing choice for a luxurious living room. This is hard to replicate with a cloth sofa. The aesthetics and the reputation of leather exudes contemporary style. Leather sofas are often used for those who suffer from allergies. The material is hypoallergenic because leather doesn’t collect and capture dust mites and other allergens as easily as cloth and fabric sofas do. For more information about interior design, please contact AKA Design Inc. or call us at 972-267-3421.